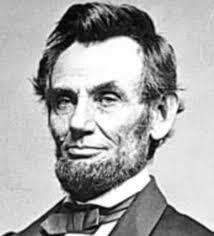 The 16th president of the United States, Abraham Lincoln, was born on February 12, 1809 in Kentucky. Oddly enough, his birthplace was only a few miles from that of the Confederacy’s first president, Jefferson Davis. When Lincoln was very young, his family moved to Indiana. His mother died when he was only 9, from what was known as milk sickness. “Honest Abe” learned how to read by firelight, and advanced from a lowly country bumpkin to a lawyer to a congressman. When he was elected president in 1860, he was the first man to run on the Republican ticket. He won with only a plurality of the popular vote, but 183 in the electoral vote. Because of threats on his life, he had to be smuggled into Washington. His wit and humor must have been tested repeatedly, for not only did his country split in two, but he suffered many personal losses as well. President Lincoln received much criticism during his presidency, especially and understandably from Southerners, but his untimely murder made many sad. It’s interesting to speculate whether Reconstruction would have gone more smoothly and wouldn’t have lasted as long if Lincoln had survived. Over the course of time, he has become a matyr for Emancipation, and has become almost a saint to most. His birthday is celebrated in conjunction every year with our first president and founding father, George Washington. Lincoln has been the subject of thousands of books, movies, articles, and other media outlets.